Stuff I am selling at Rishworth. First direct QSL beat me home! Change in 15m and 20m frequency. From KH8 I can see where I am getting out to. All bits for Ron's DSP boards have arrived... sorting now. (I have not ordered the jumpers or some of the discrete C and R I expect builder to either have their own or easy access to them). If anyone was interested please get in touch. Should have 20 sets (minus mine so 19!) some are spoken for. Looks like quite a bit of saving on the oneses and twoses prices. I will contact Ron and see if he has spare boards. Please note any comments to dodgy sites will get dropped as spam no exceptions. Just had a dozen anonymous comments and they have all gone the same way. Please do not include links to anything non amateur radio or I will not publish it. I cannot edit part of a comment so even though the rest might be useful information I'll still not publish it and report it as spam. I really would prefer it if you do have a comment or link tag with your own blog and callsign (assuming you are a radio amateur). 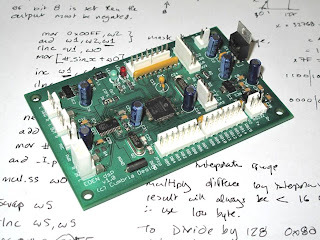 I picked up a PCB from Ron at Rishworth and want to do a group buy? He isn't doing kits at moment... you will have to get PCB from him. regulators, DSP PIC, Audio chip TLV320AIC23BPW and MAX3221CAE. 1833901 470nf 1210 cap £0.45 I only bought 5 of these for myself. I have 10 sets of them. The price is what they will cost me so I'll pass them on for same. A lot went.... those through lined. Most if not all are built projects. This has a small boom mic and the leads are mic 3.5mm and audio 3.5mm The headset has an inline volume control and a mic mute. The mic is noise cancelling too! Now I didn't want something that looked like a 'tank commander' / ear defender type over the ears and wanted something light weight and fitting for use. The lead is plenty long enough. I carry one for use with the PC (older P/N 881-000033 no noise cancelling mic) for skype and I found on 6W or KH8 easiest way to let someone hear what I was up to is connect a Y adapter and the second headset and let them listen themselves. A LOT cheaper than the Heil one that can be bought and whilst not in the same category I found perfectly usable. Ran a short pile in the QRP-ARCI contest from John (AE5X) shack. He collected me from the gate at Houston, breakfast and then operated (I setup the station as I had run it in KH8) plugged into his antennas and operated. Note the large FT240-61 ferrite on the leads for the K1EL usbwinkeyer... doesn't matter what I do I keep getting RF even at qrp back into laptop from rig from this. I had to restart wintest and other laptop bits from time to time, most annoying. Yes in contest/pile up I use cwget to help with the cw tune (last image). I do not use a hand key when running win-test either and send everything through the keyboard so you will not see a key n the picture, although I do have a palm paddle plugged in usually. W6SDM... Not created QSL cards yet ! All qso in the log with KH8/M1KTA uploaded to LoTW. 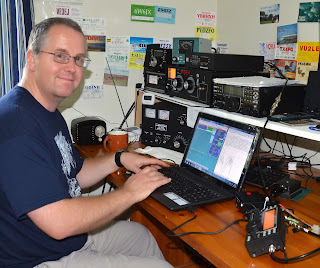 Anyone got an interesting DXpedition coming up and need an op? So what does a QRP station sound like working EU from the other side of the globe? So I ask is a qro station is really essential for those DXpeditions, if so why ? 1. Mains power not essential but makes life a lot easier all around. 2. Very well guyed antennas, if I had one major weakness it was this. WX was reported at Force 7 so winds gusting >35mph and I had two antenna supports snap in the winds. 3. Everyone said take a PA, not 100% sure needed after listening to many contacts, a PA would not have helped me hear the pile up stations any better and there were not many places I couldn't work... A PA might help me sound louder... not convinced of value except added other to the pile up. I took a pa (Homebrew ARRL design but it didn't last long, one FET blew as the bias resistor had popped and the PA current went high, zapped the car battery I had obtained for the North East shore site (no mains). 4. Do not believe the doomsayers or propagation predictions most are pure rubbish and I worked lots of stations when everything says I should not have... Why? Because the propagation predictions are just that predictions. 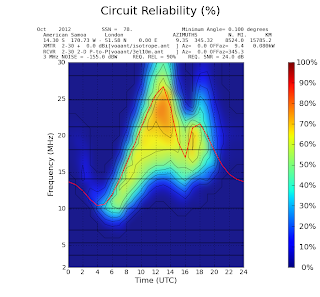 The most time the low predictions is often due to the fact there just are not 1,000's of stations from that DXCC, I think I was it for KH8 when I was there, so if someone listened somewhere where I wasn't they have said no propagation... that said posting op freqs and sticking to them and then being asked for schedules and reverse beacon and dx cluster meant most just set alarms on the call appearing... I've done a bit of cross reference log to dx spots and there is a direct correlation. 5. More time? I went for the time I did as that was what was available never planned to set records etc, happy to work plenty of qrp stations from KH8. Might be qrv from Texas as W5/M1KTA as I have a 5 hour stop over. 08:10 to 2:55pm local time. On another flight so back to airport now. The actual village chief... in case you don't recognise him...(T.T.A. Tulafono) he is American Samoa's Governor has been for last 16 years and is about to stand down in November. He is also the president of the local Rugby Union and sepnt some of the flight talking about the chances at the upcoming Oceanic championships, there was a kiwi coach on same flight. I sat next to him on flight back to Hawaii I think he arranged that as my ticket should not have warranted the seat and wanted to understand more about radio as he had met a couple Swains Guys but was not really sure what they were up to and his family had briefed him on what I was doing. I had spent some time taking to the kids after I set up the first night and showed them the world map (on the PC) with the sun/grey line and where the stations I could hear were from. Wind snapped antennas support again guys were ripped out. Hastily tapped up 'spare' also broken and put back up again, the broken one rested it against a palm tree. The 15m antenna morning after 1st night's operating. Well it started off pretty interesting. It is an ill wind that blows no good. Unusually high winds succeeded in snapping both antennas so was qrt at 4:30am local time and collected everything in. The Parks meeting had been put off until today... arrive to find it is Columbus day and the Parks office is closed... feels like a Monty Python sketch or a game of snakes and ladders... so not to be put off I'll try and hire a car and drive anyway. The fact there are only two flights a week seems to mean all hire cars are out until the next flight so have to wait until pm :-) Finally manage to secure one through Dollar and it is a 4x4. By time car arrived it is almost 4pm local time and sun set is within couple hours... so grabbed all the kit and drove up to the North East of the island... was not going to try an all nighters this time just wanted to see what the locations were. By the time I get to Aua which is where the road goes over the mountain ridge down the centre of American Samoa, it is dark... ho hum continued onto Sa'ilele and right at the end of the beach (compass out) it is pointing due north. So first find land owner and ask for permission to operate (this is ESSENTIAL HERE!) granted, so setup KX3, no PA and 15m vertical dipole using repaired pole. I ran the KX3 off the car battery (I carry a set of car battery croc clips, miniature versions).... one cq and instant pile up JA and couple Russian stations... lasted as long as the car battery did! Bit of a surprise then I read that the car was literally brand new and the battery was probably the one from the factory as it was driven off the boat so no surprise it went flat. I had just worked several dozen JA and thought try EU and cq'd... two attempts and SV9COL comes through seriously 599+20dB. Roger Western 100% correct location location location made all the difference. Anyway... qrt so pack everything away, I had remembered Petzl head torch so put that on.... now how to get the car going... fortunately one of the locals walked over and asked if I was having a problem 5 minutes later brother arrived with his truck and gives me a jump start. Funds for a beer donation my way of saying thanks. On way back took a wrong turn and ended up at Masefau.... stopped and met by a local prince and his wife, they own the hills behind the village... yes not a problem operating.... the beach location, better than Sa'ilele and the direction due north nothing until get to Russia.... ideal. I think they said they will provide mains power (I have to provide lead) for PSu and PA otherwise will be qrp again. Back at hotel now (no internet at locations above). Goiung to be QRV runrise tomorrow and every night all night until come home. 15/17/20m and will look at 40m IF it looks like an option. Will be qsy down the bands 15m and 20m to between 21 or 14.015-035 after suggestion as dx chasers likely to be ignoring me higher on 21 or 14.055. Total qso count 60 for the night pretty poor really, mostly JA's! I have some strange log anomalies too. One F station 4 el at 100ft and 1KW, and a GM 10W and a dipole, whereas I have a reported 3el 400W in UK said I was very strong but I hear nothing! No I do not have the attenuators on I checked! 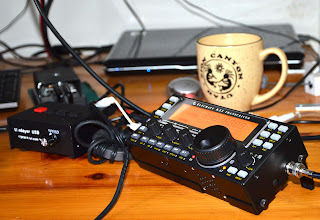 The KX3 RX has proven itself to be pretty good so cannot be that. I will put it down to Long Path problems maybe? It is Sunday day time here now... Parks service are shut until Monday (were not open as hoped on 6th) so I will visit them in Morning (8th) about going to North Shore, will need to find a portable power source though unless go qrp and on KX3 batteries only. I have a garage prepared to lend me a fully charged car battery but that is a lot to carry. 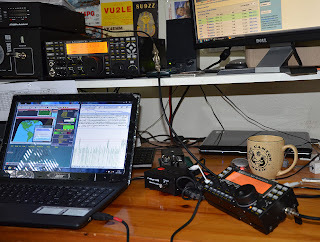 This is what it looks like for KH8 to UK.. so try me on 15m morning or evening UK time. This is the map for the best RX. I have a couple reports that the cw signal could be heard in UK! I ran a 30m beacon in cw 12 wpm mode from the 20m dipole last night. This the DX station setup. start with KX3 needs no introduction really. next is an LDG Z11-Pro II Auto atu, bit pointless really as antenna tuned. Fan on top to keep cool. Not in the picture are the three qrss beacons with me... Hans and Steve simple QRSS beacon, The Hans and Steve Ultimate beacon and the NT7S QRSS beacon. I have the latter on 30m doing a cw ident at 12wpm 10.140.408 KH8/m1KTA/AP45pr The other two will be qrss 3 and WSPR also 30m tomorrow. Didn't bring them this trip but kinda wish I had now... I have four 6m telescoping masts that collapse to just 33cm! All this fits in the carry on luggage, yes often asked lots of questions but a few photos, copy of licence, SPRAT and RadCom usually handles most things... and KX3 picks up BBC world service wonderfully too! Hastily thrown up 15m dipole. 10m pole at edge of beach right in front of hotel room. The coax balun unwound a bit. Worked couple US, Brazil, Venezuela, Malaysia, New Zealand. The vertical dipoles are also the driven elements of the vertical moxons I made up... so to switch from dipole to moxon should not take too long. I have a second pole and another similar length of coax so I might put up a 20m dipole as well. Will be qrv at some point in next 12 hours. It is 03.47am local time... very delayed arrival which also means noone checked out from where I am staying either! It is 3:47PM in UK right now (14:47 UTC) so I am 12 hour BEHIND the UK time or local reads as 11 hours BEHIND UTC. The guy on far right is John Peters K1ER who was one of those that activated Swains Island in 2006 I think... the guy behind the camera is Tets Tanaka AH7C and was also part of that original trip. Interesting conversations over waffles. To my right is Will (forget call right now), far left is Bill KH6OO who arranged KH6BB stuff for me. Had fun and operated for an hour or so. Copyright 2001-2012 Robert C. Furzer. 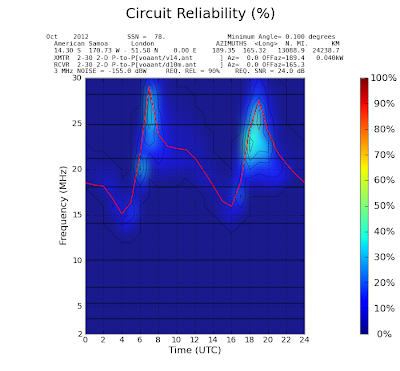 Logs generated on 04 Oct 2012 at 20:08 UTC by : KH6BB. I will be on KH6BB and QRV for an hour (there will be others in party) I expect to be on SSB bands 12/15/17 until have to go to the airport. They have put me on top floor corner as asked. I'll rig up an antenna shortly and may operate WSPR overnight. I pulled the board out of the CB Amp (RM KL-500 amp) and used the chassis heat sink, switches etc... No low pass filtering through... I'll may use a 'general attenuate everything above 30MHz LPF' or I might build something specific for the 80m and 40m bands. Best of all it comes in under weight too! Now to make up the 17/12 moxon and RG174 feeders. I'll be travelling vis San Francisco then Honolulu onto Pago Pago (Amerian Samoa). I'll be QRV from 5th October (evening UK time) probably on 20m initially. I'll be looking for qrp stations especially so if you are qrp please say so.